There’s been a lot of talk about the use of social media during the UK riots, both for good (see #riotcleanup) and for bad purposes. Additional focus was added today when PM David Cameron discussed the possibilities of limiting the use of social media in times of social unrest. It has been interesting to study how for example the UK police have used channels like Flickr and Twitter to get help with identification of suspects. 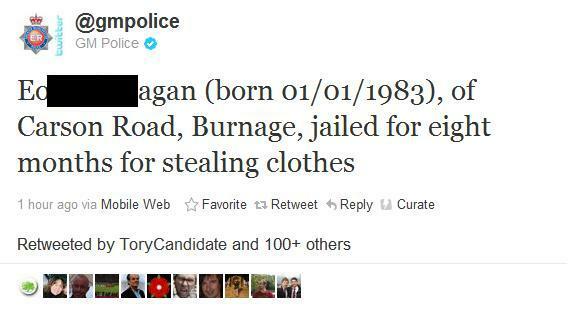 Now, however, it seems that the Greater Manchester police might have taken the use of social media one step too far. 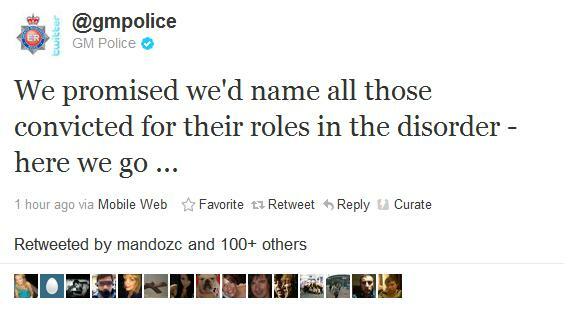 Today, the Greater Manchester police started to tweet the names and birth dates of people who have been convicted in relation to the UK riots. After this tweet, the @gmpolice Twitter account has published dozens of tweets this evening with the names, birth dates and crimes the people have been convicted for. Like this one below (I have masked the name of the individual). Many of these tweets have been retweeted by hundreds of users on Twitter which spreads their names to a very wide audience. This has already created a lot of negative reactions, like the following tweet. I can only agree with @iamminihorse, there is a huge difference between names being in the public domain and publishing them on a platform like Twitter where people can easily share them with potentially thousands of others. These things have a tendency to get out of hand and will the Manchester police take any responsibility in case some people will try to take revenge on the convicted people or their families? No, this was a bad idea from the very start.